This result is particularly important given the exceptionally hot and dry summer this year, where temperatures in a tributary of the river Dee reached a record high of 27.573°C on 28th June 2018. 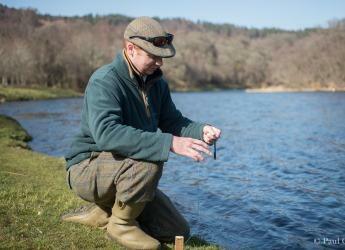 Dr Helliwell said water temperatures are hugely important as they affect the distribution, health and survival of Scotland’s iconic cold-water fish populations, with angling alone contributing £113 million per year to the Scottish rural economy. “Cold-water fish like salmon or trout will experience adverse health effects when exposed to temperatures outside their optimal range. High temperatures are a threat: brown trout stop feeding at temperatures above 20°C, and sustained water temperatures above 30°C are lethal. The increase in water temperature can be attributed to rising air temperatures in spring, less snow accumulation during winter, and earlier snowmelt. However, understanding what controls river temperatures is complex. “We modelled the water temperature of the river Spey as the first step towards assessing how future changes in climate, land-use, management, industry and water use might influence river temperatures,” Dr Helliwell added. The research team are speaking to estate managers, policy makers and regulators to highlight the root of the problem and plan to demonstrate management options including riparian woodland to enhance the resilience of rivers to change.